What Are Fibromyalgia Risk Factors? When Should I See the Doctor for Fibromyalgia? What Are the Exams and Tests to Diagnose Fibromyalgia? Are There Home Remedies for Fibromyalgia? Fibromyalgia is an illness that causes chronic pain in muscles and ligaments. The vast majority of affected people are women in their mid-30s to late-50s. In addition to chronic muscular pain and stiffness, this ailment can also cause fatigue, sleep disorders, depression, and an inability to think clearly. While there is no known cause for fibromyalgia, recent research has revealed some new facts about the disease. One of the new discoveries is that people with fibromyalgia process pain differently. The level of chemical in the cerebrospinal fluid (CSF) called substance P, which transmits pain impulses to the brain, is three times higher in people with the disease than in those who do not have the condition. This likely causes someone with fibromyalgia to experience pain more intensely. Other researchers believe fibromyalgia is caused by a lack of deep sleep. It is during stage 4 sleep that muscles recover from the prior day's activity, and the body refreshes itself. Sleep studies show that as people with fibromyalgia enter stage 4 sleep, they become more aroused and stay in a lighter form of sleep. Even though they may sleep for a long period of time, they get poor quality sleep. Also, when researchers took normal volunteers and did not allow them to enter into stage 4 sleep, they developed widespread pain symptoms similar to those of fibromyalgia patients. Risk factors for fibromyalgia include having a family history of fibromyalgia in a relative or family member, physical or emotional trauma, and having a sleep disorder. Pain: The most prominent symptom of fibromyalgia is widespread pain. Unlike arthritis, the discomfort is not in the joints, but in the muscles and ligaments. The pain is commonly located in the neck, shoulders, back, and hips. There is also diffuse tenderness, as if the sensory portions of the nervous system are extra sensitive. The tenderness is worse in the mornings and has been described as flu-like, burning, throbbing, aching, or stabbing. Fatigue: Another frequent complaint associated with fibromyalgia is fatigue. In fact, it occurs so commonly that some doctors think fibromyalgia and chronic fatigue syndrome are the same disease. The severity of the fatigue can range from mild to incapacitating. In its worse form, fatigue can be so debilitating that some people have trouble keeping their jobs. No amount of sleep at night or rest during the day is helpful for relief. Fibrofog: Another common symptom is a mental haziness some people call fibrofog. This refers to the inability to concentrate, memory loss, and depression that occurs with fibromyalgia. Other symptoms associated with fibromyalgia are insomnia, headaches, nervousness, numbness, dizziness, and intestinal disturbances, including irritable bowel syndrome (IBS). Call your doctor if you have symptoms of fibromyalgia. If you have already been diagnosed and your pain is getting worse, call for a follow-up visit. Some new treatments may have been discovered since your last visit. It is rare that a person with fibromyalgia would need to visit a hospital's emergency department. If you feel that you need an injection to help control the pain or the pain is different this time, check with your doctor before going to the hospital. Rheumatologists are specialists who diagnose and treat fibromyalgia patients. No simple blood test or X-ray can tell you if you have fibromyalgia. The diagnosis is made solely by taking a history and doing a physical exam. Your doctor may still want to do blood tests or X-rays to rule out illnesses that mimic fibromyalgia. 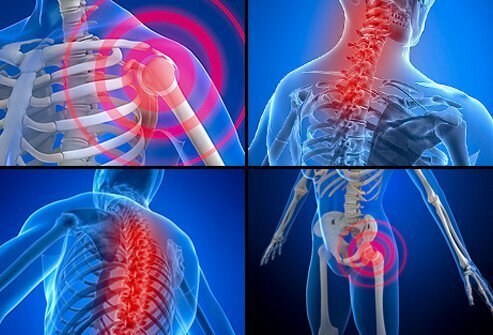 According to the American College of Rheumatology, before the diagnosis of fibromyalgia can be made, the muscle pain must be present for longer than three months. Also, pain must occur at specific sites on the body called tender points. There are 18 of these sensitive spots. Most are located on the neck and back. Your doctor makes the diagnosis by applying mild pressure to the tender points. If discomfort occurs at 11 or more of these points, then the physical exam is positive for fibromyalgia. Although there is no cure for fibromyalgia, home treatment can relieve some of the symptoms. The most important therapy for the muscle pain of fibromyalgia is regular, low-impact exercise. Keeping muscles conditioned and healthy by exercising three times a week decreases the amount of discomfort. It is important to try low-stress exercises such as walking, swimming, water aerobics, and biking rather than muscle-straining exercises such as weight training. Besides helping with tenderness, regular exercises can also boost energy levels and help with sleep and is a key part of the treatment of fibromyalgia without medications. Over-the-counter pain medications such as acetaminophen (Tylenol), aspirin, ibuprofen (Advil), and naproxen (Aleve) may help. Gabapentin (Lyrica), duloxetine (Cymbalta), and milnacipran (Savella): These are the only three drugs approved by the U.S. FDA for the treatment of fibromyalgia. Lyrica is an antiseizure medication, while Cymbalta and Savella are antidepressants. All three have been shown to reduce the pain of fibromyalgia. Cyclobenzaprine (Flexeril): This muscle relaxant not only decreases muscle pain but also improves sleep. Pramipexole (Mirapex): This drug is used in the treatment of Parkinson's disease. When used to treat fibromyalgia, it reduced pain in a majority of patients. Low doses of antidepressant medication: These medicines improve sleep and decrease pain as well as eliminate depression. Biofeedback and relaxation techniques: Besides lessening pain, these therapies also decrease the number of tender points. Acupuncture: Multiple studies have shown that acupuncture can decrease tender point pain. Tender point injections: Steroid or lidocaine injections into a painful area may provide temporary relief. Massage therapy: This can help relax and soothe painful muscles. There is no known way to prevent fibromyalgia because the cause is not fully understood. Adopting a healthy lifestyle, getting enough sleep, and maintaining a positive outlook are ways all people can work toward optimal health. While there is no cure for fibromyalgia, combining home treatments with your doctor's care will decrease your pain and help minimize symptoms. There is hope on the horizon as several drug companies are testing new drugs to combat this painful disease. Fibromyalgia is a condition that causes chronic ligament and muscle pain. Managing stress, engaging in regular exercise, taking notes, and avoiding caffeine can help one cope with the symptoms of fibromyalgia. Get additional tips and home remedies that help treat fibromylagia symptoms. How was your fibromyalgia treated?